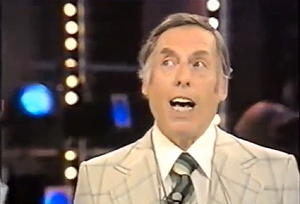 So, who was the best Generation Game presenter? 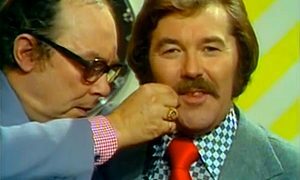 Well, it certainly wasn’t Jim Davidson but we reckon it’s impossible to choose between the other two, both of whom found it a fantastic format for their individual talents. 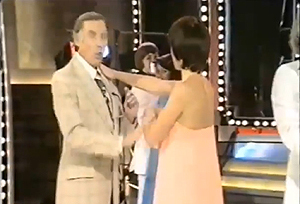 Both came at it from a different angle, with Brucie coming across as if he was trying to put on a good show and the contestants were ruining it for him, whereas Larry suggested he was trying to put on a good show but his own ineptitude was ruining it. As was pointed out, Larry’s approach put a whole new spin on the long-running series and one of the changes was that now Larry himself could join in with the games and mess them up, which was never an option under Brucie because Brucie’s character meant he could never be seen to get things wrong. There was perhaps the danger that he would overshadow the contestants but his approach was so war m they never felt left out, Larry simply adding the comedic icing to the cake. Here’s a great example of that in action, as well as an illustration of the production team’s ability to move with times and look for new ideas, as Legs & Co – albeit sans the official best two members in Sue and Lulu, but with their old mate Floyd – participate in some disco dancing. The clip we’ve got here edits out the contestants’ efforts, though doubtless they were terribly amusing, but leaves in Larry and Isla having a go, and it’s great fun. 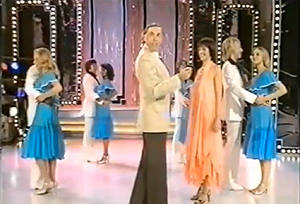 The routine sums up Larry’s whole approach to the show, a case of less is more, getting laughs from a simple raised eyebrow or pertinent comment, while his best girl Isla tries to keep things on the rails. Add to that his trademark patter, full of archaic references that were completely incomprehensible to a modern audience but that was all part of his appeal, and the fact he’s doing it all in a dowdy three piece suit looking as if he’d just stepped out of a bank queue and couldn’t believe he’d found himself on television. Everyone’s having a lovely time and it’s all thanks to Larry’s good humour and charm. An unlikely TV star, but a fantastic one.